Edakkal Caves Malayalam: ഇടക്കൽ ഗുഹകൾ are two natural caves at a remote location at Edakkal, 25 km (15.5 mi) from Kalpetta in the Wayanad district of Kerala in India’s Western Ghats. They lie 1,200 m (3,900 ft) above sea level on Ambukutty Mala, near an ancient trade route connecting the high mountains of Mysore to the ports of the Malabar coast. 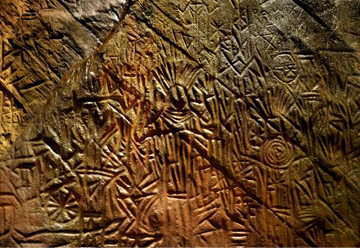 Inside the caves are pictorial writings believed to date to at least 6,000 BCE,rom the Neolithic man, indicating the presence of a prehistoric civilization or settlement in this region. The Stone Age carvings of Edakkal are rare and are the only known examples from South India.